(Will dissolve approximately 30 minutes after being introduced to the skimmer) Our 2 ounce quick dissolving tablets are designed for skimmers and should never be added to any type of automatic chlorine feeder. Provides 59% available chlorine and 1 Rapid Tab will treat 8,000 gallons of pool water. Available In 4LB, 10LB, 15LB, 25LB and 40LB. For fast treatment of yellow and mustard algae in swimming pools. 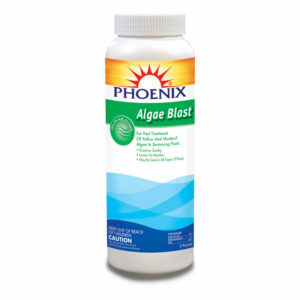 Algae Blast clears water quickly and can be used in any type of swimming pool. Swimming may be resumed several hours after treatment. All dosages are for 10,000 gallons of water. Brush walls and floor areas affected by yellow algae accumulations. Apply 4 oz. of Algae Blast per 10,000 gallons as close to the affected areas as possible. For severe accumulations, double the above dosage. Activate by shocking based on your pool’s sanitation type following directions of that product’s label. Swimming may be resumed a few hours after treatment. 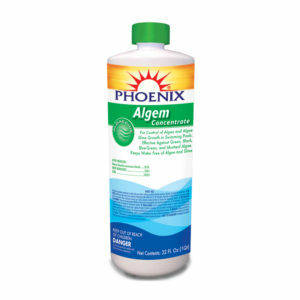 Weekly maintenance: To prevent accumulation of yellow algae: For water temperature over 80F, add 4 oz. Algae Blast with 1 gallon liquid chlorine or 1 pound of a dry chlorine once a week. For water temperature under 80F, add 2 oz. Algae Blast weekly and 1/2 gallon liquid chlorine or 1/2 pound of a dry chlorine. Available in 1LB and 2LB. 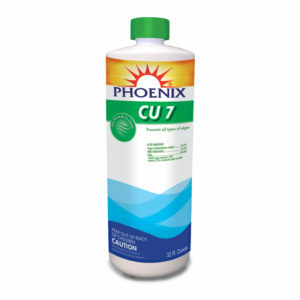 (7% Copper) Made especially to control growth of algae and bacteria growth in all types of swimming pools. 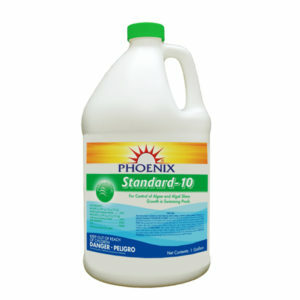 Its long lasting action will control existing algae and subsequent doses will control recontamination by algae. Treated water can be used immediately. This product comes concentrated. 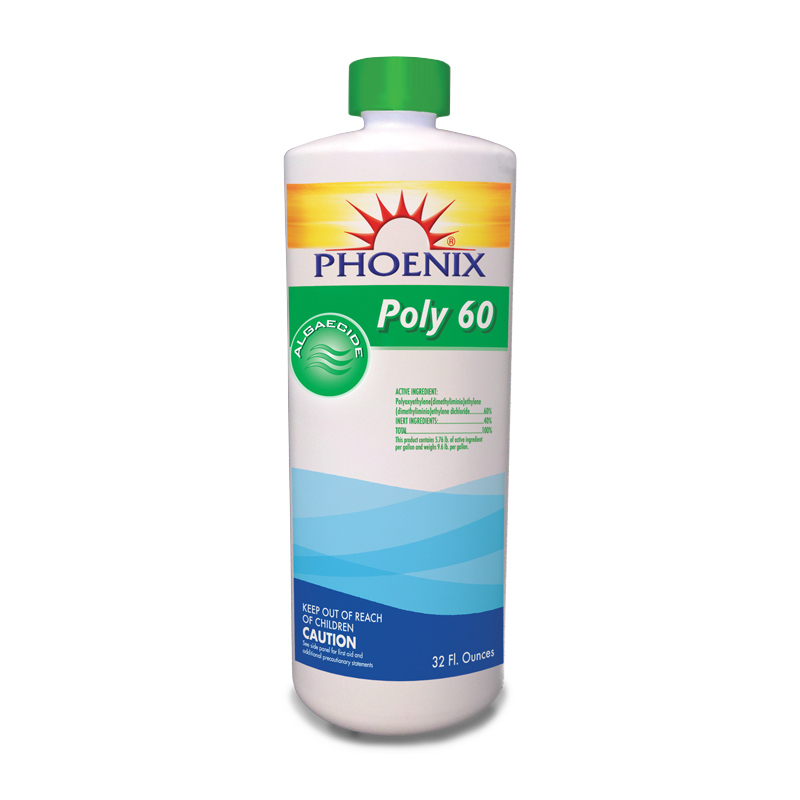 Dilute with at least nine parts of water before applying. Dilution rate for 10,000 gallons of water is 4 oz. for initial treatment and 2 oz. once every two weeks. Pour required amount into a plastic watering can, fill with water and sprinkle around edge of pool. Apply initial treatment to a freshly filled pool or at first visible signs of algae growth. Apply under sunny conditions for most effective results. Is a full strength, concentrated algaecide that is compatible with the Biquanide system. 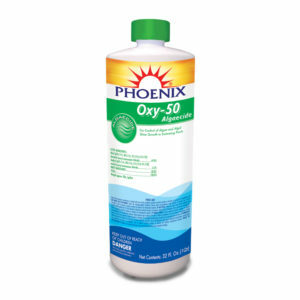 In order to keep algae from the point where it becomes visible and unsightly, it is necessary to maintain a level of Oxy 50 in the pool. A weekly maintenance dose helps to prevent an algae bloom. Available In Quart. Algaecide used to control the growth of algae in swimming pools, exterior spas, whirlpools, hot tubs, and decorative fountains. Swimming pool algaecide supplement effective against green, black, blue-green, and mustard algae. Keeps water free of algae and slime. Effective in controlling algae and algal slime growth in swimming pools. This product is compatible with most chemicals normally used in swimming pool maintenance: however, in its concentrated form, this chemical must not come in contact with high concentrations of chlorine or any other oxidizer.